This actually makes a lot of sense, as otherwise, it would be difficult to handle returns. If codes can be redeemed before the window to return the device has ended, it makes the return process more complicated. This is a much simpler solution, even if it means that we might have to wait a while for our free Home Minis. A little update about your Google Home Mini. High five for ordering Pixel 2, the latest phone from Google. Now you’re eligible to get a Google Home Mini on us. 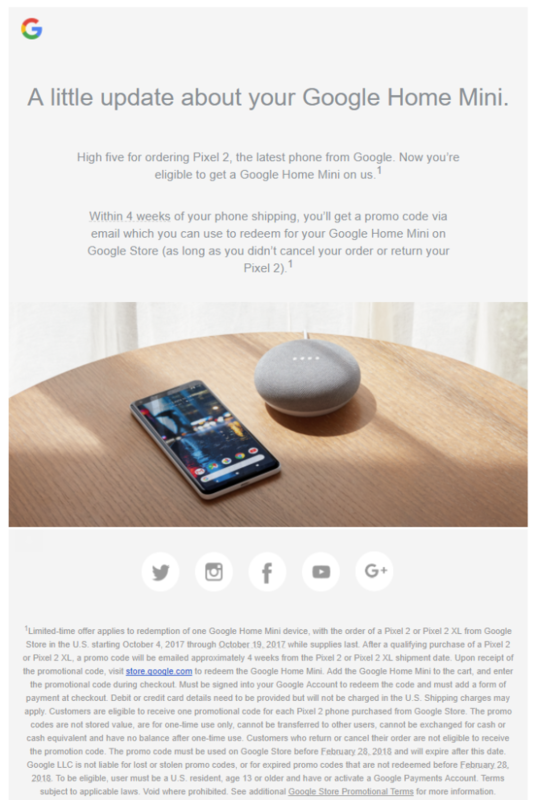 Within 4 weeks of your phone shipping, you’ll get a promo code via email which you can use to redeem for your Google Home Mini on Google Store (as long as you didn’t cancel your order or return your Pixel 2). So, there you have it. Some of us that might have been a bit late to order (like me) might end up redeeming our codes sometime around Christmas. I'll just have to think of it as Google's holiday present to me.